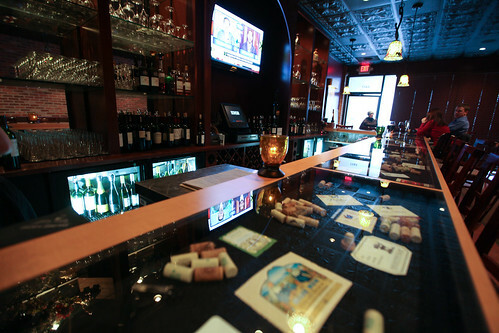 Even before you walk in the door, Chops Wine Bar upsets your expectations. Nestled somewhere between Uncle Bill’s Pet Center and a Pak Mail in The Village at Time Corners shopping center in Fort Wayne, IN, it’s not exactly the type of place you’d expect to find one of the city’s fine dining establishments. Yet, as soon as you walk in the door, and see the well-stocked bar and the array of wine glasses glittering behind it, it becomes clear that that’s exactly where you’re at. Chops Wine Bar (CWB) makes upsetting expectations and surprising patrons a habit. It’s one of the best qualities of the one-year-old establishment, and it’s most evident on the food menu. 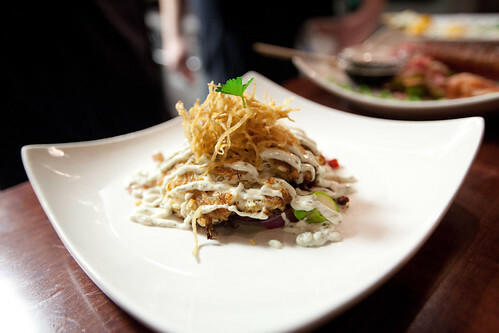 On my inaugural trip to CWB, the first dish I ordered was the Blue Crab Cake. It would’ve been one thing for Chef Brian Shreffler to promise that the crab cake would be good. But he promised that it’d stand toe-to-toe with the best crab cakes on the east coast. As anyone who’s been to the east coast knows, crab cakes are their specialty. Entire restaurants are based around the tasty crustacean dish. So, for Chef Brian to make a promise like that, it was a big deal. As someone who’s sampled both east coast crab cakes and their Midwestern counterparts, I can safely say that there’s no comparison between the two. There’s just not. So, going into my first dish, I was fully expecting that my crab cake, while good, wouldn’t hold a candle to its east coast counterparts. Made with lump blue crab, roasted vegetables, béarnaise aioli, and crispy potatoes, the crab cake that Chef Brian prepared tasted as good as anything I’d eaten out east. It’s a tribute to his attention to detail, which begins with the individual ingredients of a dish, as compared to the assembled whole. This was the difference between my crab cake tasting like the real deal and just another Midwestern imitation. With this good favor curried with me, you’d think I’d have approached my next dish with less skepticism. But I didn’t. 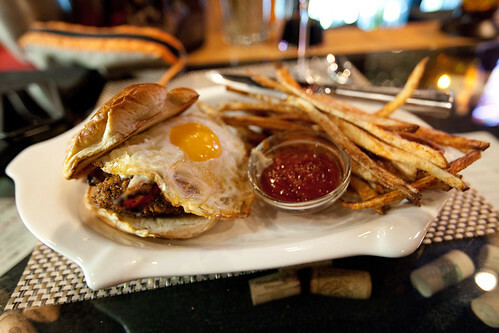 I ordered something after the Big Bad Wolf’s own heart – a sandwich consisting of crispy pork, peppered bacon, and smoked ham, accompanied by a fried egg, gruyere and mustard aioli, completed by pretzel bread buns. It’s called the 3 Little Pigs. Perhaps if I’d ordered something a little more conventional, I wouldn’t have been so skeptical. However, in this case, it was hard not to be. See, I love pork, bacon, and ham. But I love them on separate sandwiches. And I love a good fried egg, too. But for breakfast, and not on top of the sandwich I’m having for dinner. Well, appropriately enough, just like the Big Bad Wolf, the 3 Little Pigs defeated me, too. With the first bite, it became clear that, again, Chef Brian had chosen just the right ingredients and that those ingredients worked in unison to create a superb dish. Each meat was present in such a quantity and prepared in such a way that it didn’t overpower the other meats — something that probably took a few tries to get right, I’m sure. The taste of the mustard aioli stood in stark contrast to that of the meats and added some nice zest to the dish. As for the egg, I can’t imagine the sandwich without it. By the time I polished off the sandwich (and the accompanying hand-cut fries with specialty ketchup), I was getting pretty full. However, CWB has a dessert menu. And I figured that my CWB experience probably wouldn’t be complete until I had something off of that, too. CWB had already upset my expectations twice that night. The Blue Crab Cake actually tasted like an east coast crab cake. The 3 Little Pigs sandwich turned out to be one of the best sandwiches I’d had in quite a while. That said, I didn’t see how there was any chance the dessert that Chef Brian suggested I order would upset my expectations for a third time that night. When I think of dessert, I don’t think of French toast. And I certainly don’t think of bacon. Those two things happened to be the main components of the dessert that Chef Brian served me. 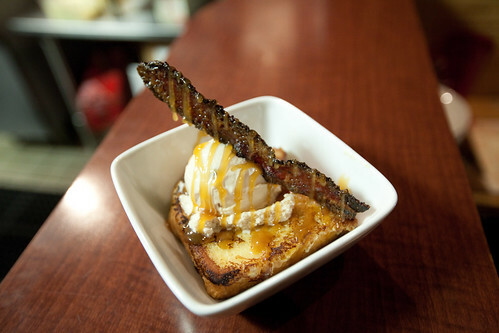 Consisting of a thick piece of French toast, a big scoop of vanilla ice cream, a piece of bacon perched on top, and caramel sauce drizzled over everything, it’s safe to say that the dish was unlike any dessert I’d ever seen. I was skeptical when Chef Brian suggested it and stubbornly remained skeptical once he delivered it. However, with the dish sitting right in front of me, there was no turning back. I was surprised by how well the French toast, ice cream, and caramel sauce complimented one another. They were all sweet, without verging on rich, and a perfect mix of consistencies, ranging from light, to medium, to heavy. The bacon was a surprisingly strong accompaniment. It was a nice change of pace, being so texturally and flavorfully different from the other components. However, the coating of caramel on it ensured that it wasn’t so texturally and flavorfully different from the other components that it became a distraction. It wasn’t until after I finished the dish that I realized CWB was for three-for-three. Three straight dishes where I expected one thing and got quite another. Some restaurants dedicate themselves to living up to the expectations of customers. If you go to a place that you’ve heard has a good burger, and the burger turns out to be just as good as you’d thought it’d be, you and the restaurant are both satisfied. That’s nice. But it’s also boring. While CWB does appreciate the value of living up to the expectations of its customers – something it accomplishes through its wine menu, which will satisfy even the most discriminating wine drinker – it also realizes the importance of turning the expectations of customers upside-down. It’s a philosophy that makes dining less a chore and more of an experience, and CWB is all the richer for it.